It was late evening when, Vivek knocked at my room and asked me if I would like to go by road to Adelaide the next morning. We had been in Melbourne for two days attending a conference. ‘Why not?’ I jumped at the offer in excitement. After all, one does not get an opportunity to travel a distance of more than 700 km in a day and that too to see the ‘Great Ocean Road’. We collected a few things for the weekend trip which was to commence on a Saturday morning in August. The stopover for night was planned at Adelaide at an old friend’s place. Next morning, I woke up, thrilled at the prospect to undertake the longest road journey of my life! 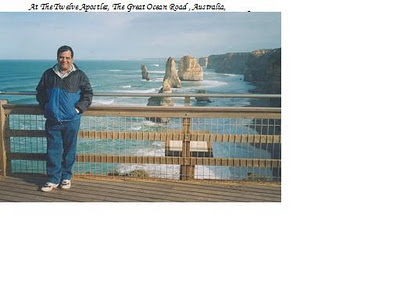 Vivek, had stayed in Australia earlier and had the valid driving license so rest of the logistics was fairly easy. We rented a car and took off for the trip! The roads were relatively free from traffic at Flinders Street as we headed towards Geelong. We pored over the map and charted the course as follows: Melbourne- Geelong- Torquay-Warrnambool- Portland-Mount Gambier-Sherwood- Adelaide( See the map). We estimated that the drive would take almost 9 hours without taking halts! So we would reach sometime in the evening to our destination as long as captivating sights do not delay us further! The road was built by the soldiers between 1919 and 1932 and is dedicated to the war casualties of World War I and is the largest war memorial. This road is now included in the list of Australian Heritage sites this year. 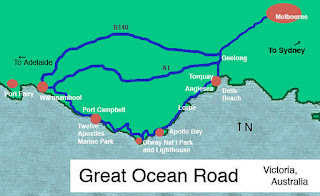 The Great Ocean Road is a 2 hour drive from Melbourne with a dual lane highway. From Geelong onwards the ride along the ocean offers some of the most breathtaking views of the coastal scenery with enticing giant sea waves giving company. There is a great variety of flora and fauna interlaced with local culture, history and a wide variety of wild life ranging from Kangaroos to occasional sighting of Koalas! There are certain stretches where one can see whales, if lucky! There are lighthouses and some traditional fishermen villages, shipwreck sites and maritime museums. It is literally a treasure trove to explore. There are scores of gourmet seafood restaurants, regional cheese and wine making centers en route. Wild berries, olives and citrus fruits grow in this region. At the Melba Gully one can see the glow worms in the dense foliage of rain forest near Otways, which look like a million twinkling stars descended from heaven. The rollicking fur seals and dolphins can be sighted in Port Philip Bay. The drive is a rewarding experience of unsurpassed visual beauty and a feast for eyes. I was reminded of the famous John Denver’s song ‘Country Roads take me home, through the plains!’ as we proceeded. Soon the long undulating road welcomed us to the outskirts of Adelaide. The street lights had come on and the euphoria of having seen some of the most captivating sights kept me enthralled in days to come! Ohhhh you brought back wonderful memories. Great Ocean Road is a beautiful drive, I used to take all my guests there. We even stayed overnight in Apollo Bay. Did you see the penguins on Philip Island? What a great post- this sounds absolutely wonderful- loved the ending could just imagine the John Denver song playing with the great scenery all around. Country-roads - would love a trip as well now, so refreshing! I would love to go there. I like the rocks out in the sea very much. Think it must be great for bouldering. It looks very much like Sagres in Portugal. I feel so jealous of you when I read posts on your travel experiences. First you have been to almost all the beautiful places in the world. And second, even if they are not so beautiful you weave magic in your words. I love when you take me to geographical places I never knew existed via your beautiful writings, Rahul! The photos are spectacular, especially the first one, and who doesn't love that John Denver song?! @ Anjuli- Thanks a ton for the nice comments! @ Kalai- Thanks,I am happy to share my travel experience ..
@ PhilO- Yeah! long journeys as what I adore too besides John Denver's classic song! @ Martina-Would seriously recommend this trip to anyone who loves nature! @ Sujatha- Lucky and blessed for sure to have seen some of these places! @ Lady Fiona- What ever I wrote for Saru, is equally true for you too! 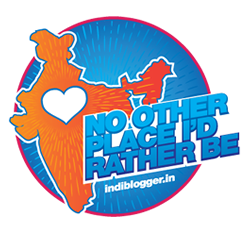 I will endeavor to write about other travel experiences in future too..
As I love to travel so I enjoy your posts. Marvellous scenic beauty with lovely description. Great post! 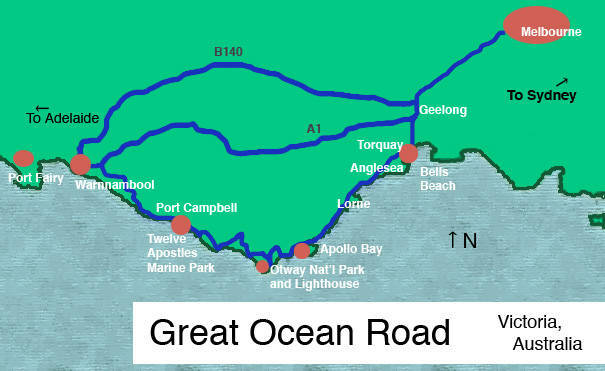 I've never driven on the Great Ocean Road but will definitely do so in the future. It looks so beautiful. I've never been to australia. I hope I can go there some time because I think it's an amazing place!! @ Babli- Thanks for your nice comments! @Luar- Many thanks for your nice comments!Am sure you will enjoy this trip when ever you decide to go! @ Sam- Yes! It is well worth a visit. Am grateful for your kind comment..
Great post. I haven't been to Melbourne yet and I hope someday we can visit there. Wow, haven't been there but sounds so wonderful. Great Ocean Road sounds like a wonderful road by which to travel. You sure do have a travel bug, Rahul. The BB- Chintan, you have evoked memories of my childhood with that sweet comment! Truly delightful it was! You are such a gifted writer that whatever you pen is lapped up like hot cakes..
@Andrea- Thanks a lot for the follow! Australia is a great country for sure! the trips looks so awesome..we have ECR here in Chennai..wish they could develop it into something so memorable.